In a deep, medium-size saucepan, whisk flour, sugar and cinnamon into milk. Stir in quinoa and water. Bring to a boil over medium-high heat, stirring occasionally. Reduce heat to low, cover and simmer, stirring often, for 20 minutes. 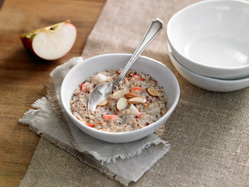 Stir in diced apple, cover and simmer, stirring often, for about 5 minutes or until quinoa and apple pieces are tender. Remove from heat and let stand, covered, for 3 minutes. Spoon into bowls and sprinkle with nuts or sunflower seeds (if desired) and cinnamon. Add a hint of maple syrup or brown sugar, if desired. Tips: Quinoa can have a bitter coating, called saponin, on the surface of the grain. Most quinoa sold is pre-rinsed but it’s best to rinse it just in case. Place quinoa in a fine-mesh sieve and rinse well under cold, running water and drain well. Use a deep pan when simmering recipes using milk, as it tends to bubble up. Keep a close eye on the pan and lift the lid and stir frequently to make sure the milk doesn’t boil over. Use an apple variety that holds its flavour when cooked, such as Empire, McIntosh, Northern Spy, Idared or Spartan. Prep Time: 10 min. Cook Time: 30 min. Makes: 4 servings Source: www.heartandstroke.com (recipe provided by Dairy Farmers of Canada).